McMahon provides a general overview of the Financial Investigator. He then breaks down the various categories with complete explanations, examples and even a vocabulary review to enhance the reader’s knowledge. References to current federal legislation, sources of information and examples provide a complete coverage of each area of financial investigation from Bankruptcy Fraud to Wire Fraud and everything in between. A well organized glossary and index provide the reader with easy to find citations. 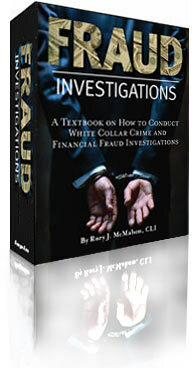 In fact, the glossary by itself makes an excellent and thorough dictionary of terms used in the world of financial fraud. Between 1978 and 1991, Rory J. McMahon was a Federal Probation officer in the Southern Districts of New York and Florida. From 1990 and 1998, Rory was an Instructor and Department Chair of the Private Investigative Services Program at City College, a private accredited Junior College in Ft. Lauderdale. McMahon has been the President of R.J. McMahon and Associates, Inc. since 1991. He was a founding father of the Florida Association of Licensed Investigators and is the former Southeast Region Director for the National Association of Legal Investigators (NALI). In 1997, he passed the rigid requirements to become certified as a Legal Investigator. Two years later he became a Florida Certified Investigator through FALI. In January, 2000 Rory was recognized as a Board Certified Criminal Defense Investigator by the Criminal Defense Investigation Training Council. He was also named to their Board of Directors. Copyright: 2006 All rights reserved.